← Get Up and Move! As a kid, I definitely had my share of granola bars. I have flirted with all the different flavors, but have been committed to the chocolate chip chewy granola bars. I have also never been concerned with the contents of the bars, because granola is supposed to be good for you right? I have come to find that this is not always the case. The basics of granola are simple: whole grain rolled oats and honey, toasted in the oven. Sometimes nuts, dried fruit, and seeds are added as well. Granola is an amazing source of whole grains and can provide protein, phosphorus, iron, zinc, copper, magnesium, etc. etc. depending on the kind you get. Look at your box of granola bars and count how many extra ingredients it contains. How many of those ingredients are sugar in one form or another? Pretty shocking right? So now we see yet another really amazing health food, get drowned in so many bad ingredients that you might as well pick up a Kit Kat bar. The goal with granola is to make sure it is organic, contains no trans fats, is sweetened naturally, and contains no artificial preservatives, flavors, or colors. If you follow those tips, you are likely to find a product that is extremely good for you. If this does not sound appetizing and all you can picture is chewing on a tree branch I promise you, granola is for everyone. Today I ventured out to try loose granola (in a bag and not packed into bars) to see if it is even edible. 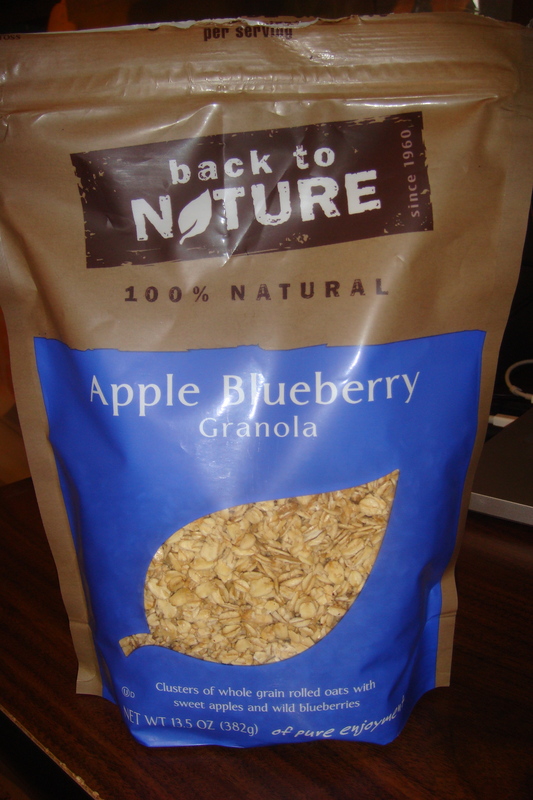 I went to my local grocery store and picked up Back to Nature’s Apple Blueberry granola. It satisfies all the requirements and it was delicious! I ate it right out of the bag and I thoroughly enjoyed it. The best part, is that each 1/2 cup serving size contains 38g of whole grains which brings you much closer to the recommended 48g a day than my favorite granola bar would (containing only 18g). Although you may think healthy granola is out of reach, this bag (8 servings worth) was $3.59, less than your Starbucks coffee. It may still be tempting to buy that giant box of fruity sugary cereal for that same price or less but remember, what you save now on price, you may be paying for it later with your health. My suggestion: pay a little more now for a great source of whole grains, no trans fats, and reduced sugar content. And if you are still obsessed with the idea of granola in bar form, there are tons of great recipes online to make your own. Making your own granola bars guarantees that you know what is in it and you can control how much sugar you are adding. So what is the verdict? Granola is definitely a health food if done right. Enjoy granola, your body will thank you. This entry was posted in Nutrition and tagged food, granola, health, healthy, organic. Bookmark the permalink.